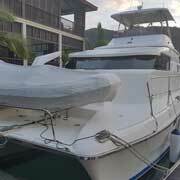 50 Aventure Power Cat for sale. 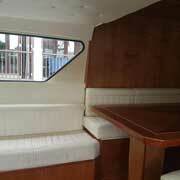 Recently launched power vessel with all the extras. 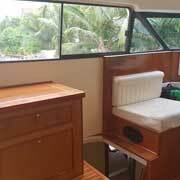 Great live-aboard and a very suitable fishing or dive vessel. 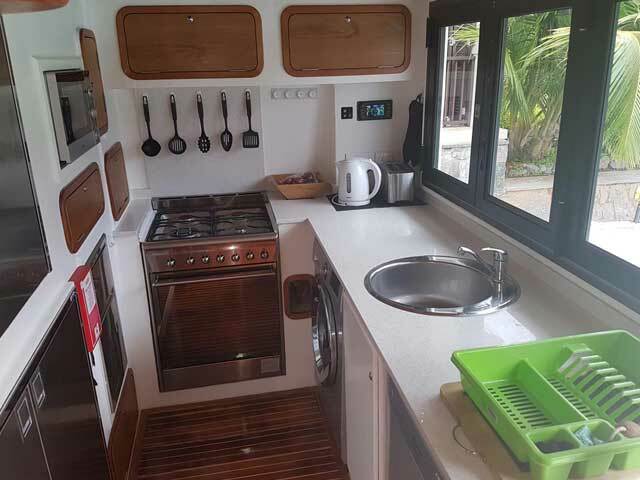 4 Cabin layout with spacious interior. 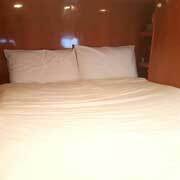 Currently moored out of SA. 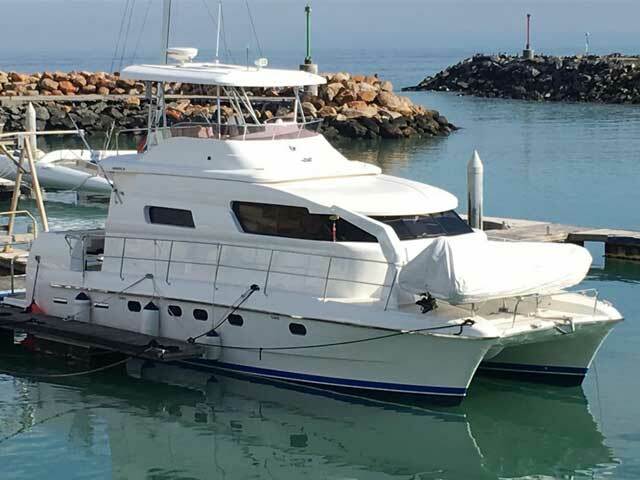 2 x 315hp Yanmar 6LPA-STP2 6-cylinder drive-shaft engines, 1600L diesel storage in 2 stainless steel tanks, ZF gearbox, 8 batteries, 4-blade Tiger props, 2 Racor fuel separator filters, fitted with Algae-X fuel filters, engine room fitted with Fireball extinguisher system, Raymarine EC100 engine control interface. 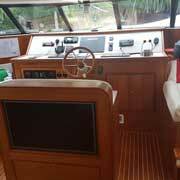 Cruising speed: 18 knots. 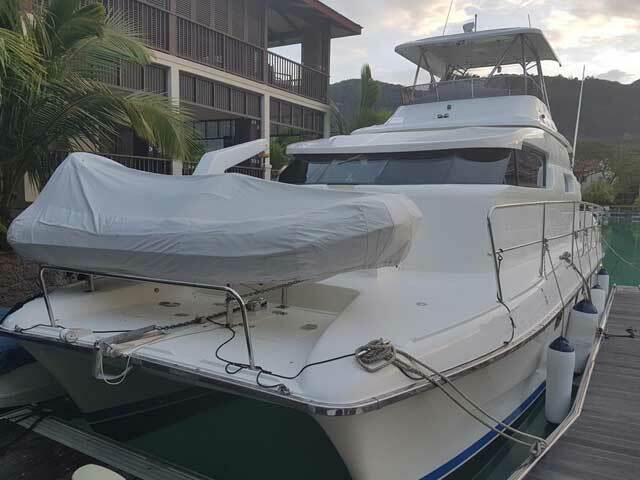 Hydraulic steering from cabin and flybridge positions (flybridge fitted with custom hardtop with roll down sides), Raymarine Evolution ACU400 Type 3 autopilot with P70R control head. 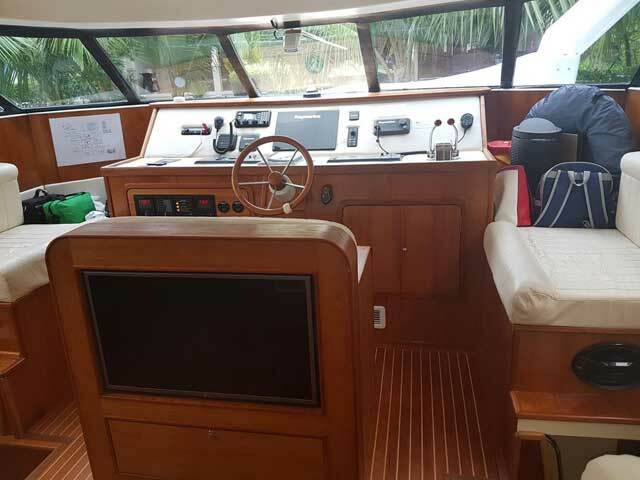 Raymarine VHF with flybridge remote, Raymarine 4kW HD Radar, 2 GS165 15.4inch Glass Bridge plotters with RMK9 remote keypad, Raymarine fish finder with chirp module, Raymarine i70 log, 2 bulkhead compasses, battery management system, 2 x 80W solar mat on bimini, 220V Victron inverter, 15kW Kohler generator, Victron shore power charger, shore power connection and cable, USB plug fittings at pilot house as well as cabins, LED 32 inch fitted in saloon, LED 32 inch fitted at stern to repeat fishfinder and chart plotter, 2 Raymarine CAM200 cameras, music system, 48000BTU aircon. 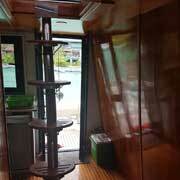 Total berths: 8. 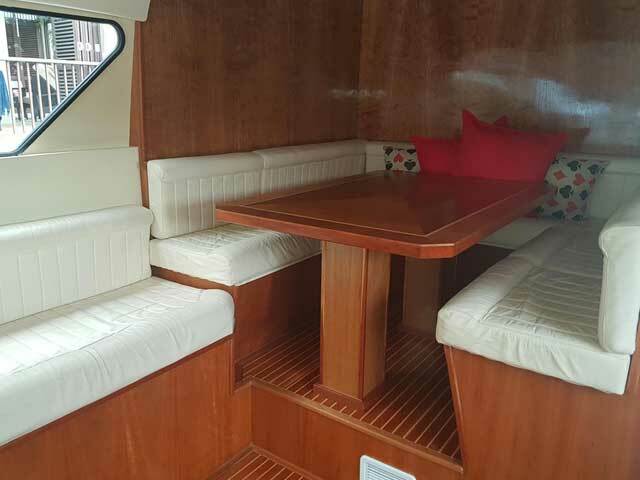 4 Cabins with 3 double and a ¾ berth plus ¾ berth in saloon if required, 2 electric heads, 2 showers, 2 basins, 2 x 40L black-water tanks, leather upholstery in saloon and material in cabins, Teak and Holly floor. 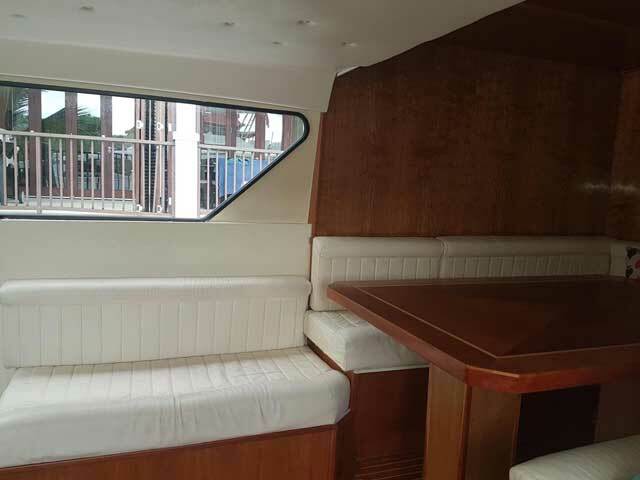 Large entertainment saloon area which has large windows for good visibility, galley is comfortable and set aft behind the cockpit, fitted with aluminium stack windows, cabin are well appointed and share midships heads compartments, cabin fans throughout. 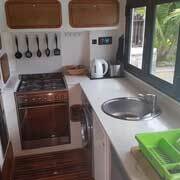 4-Burner stove with oven and grill, microwave, Isotherm fridge, Isotherm freezer, Isotherm bar fried at flybridge, 2 gas bottles, gas alarm, double stainless steel sink, washer/dryer, dishwasher, Isotherm ice-maker, galley fitted with granite work tops, pressurised hot and cold fresh water system. 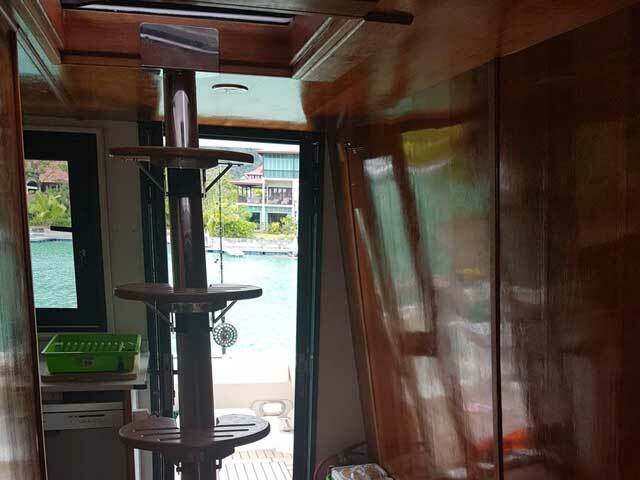 320L Water storage in 2 stainless steel tanks, pressurised hot and cold fresh water system - hot from calorifier, 8 bilge pumps - 2 manual and 6 electric. 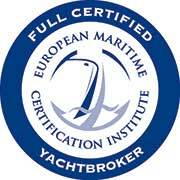 2 Anchors, chain and warp, electric windlass, 12 life jackets, 2 life rings, 6 fire extinguishers, first-aid-kit, 12-man life raft (new 2016), Epirb, Category A safety certificate. 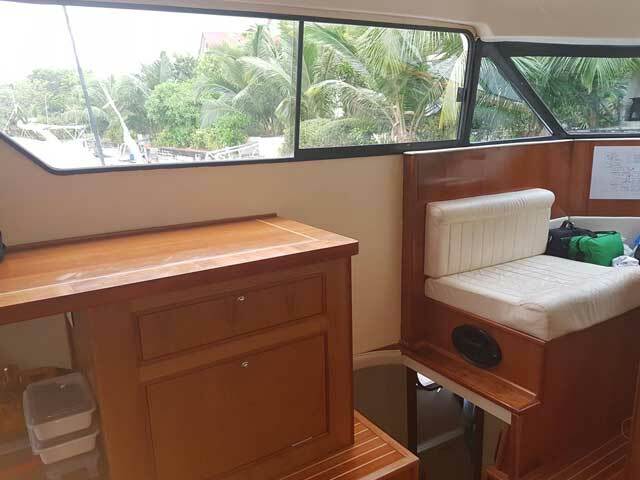 Gemini Hypalon dinghy with centre console, 30hp Suzuki DF30ATL outboard, Spectra 12V Ventura watermaker, live bait well, 2 aft deck spot lights, aft deck hot and cold shower, fresh and sea water deck-wash, 8 rod holders and 6 rocket launchers, Rupp outriggers, custom built fighting chair, fenders and mooring lines. 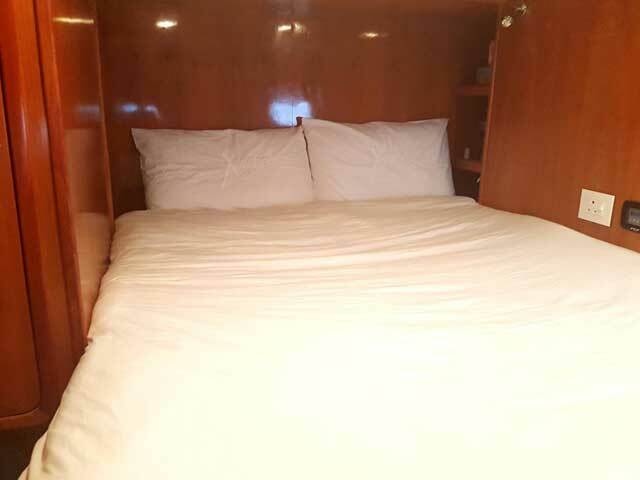 50 Aventure with 4 cabin layout, large aft galley, very comfortable saloon easily seating 8, interior helming station with large flybridge comfortable seating 4 to 6 and which has a custom fitted hardtop bimini including roll-down sides. 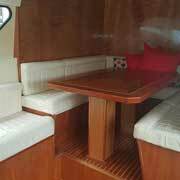 Vessel is in superb condition and has all the extras. Currently kept offshore. 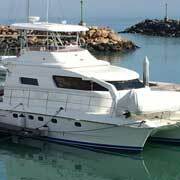 Vessel is company owned and Vat will be payable.